Based on Joyce Meyer's New York Times best seller Power Thoughts, this devotional includes 365 opportunities to tap into God's power in your daily life by thinking and speaking His way. 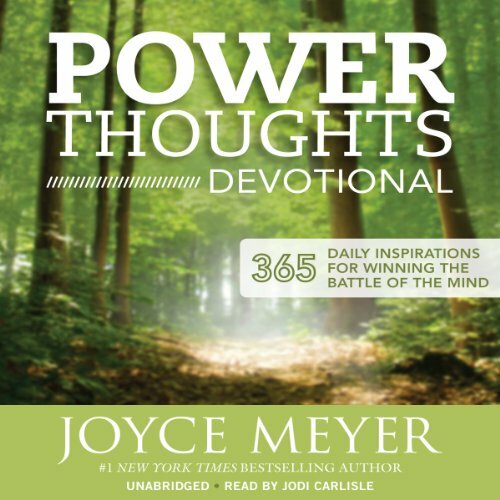 The Power Thoughts Devotional will provide you with life-changing declarations of truth, directly from God's word, to think and speak over your life every day of the year. Proverbs 18:21 says, "Death and life are in the power of the tongue." Simply put, words are containers for power - positive or negative, creative or destructive. Therefore, it is imperative that you learn to think and speak on purpose, using the life-giving wisdom in God's word. When you do, your life will never be the same! If you struggle with being negative, critical, or judgmental of people and situations, don't be discouraged. God wants to help you renew your mind to think and speak as He would. It won't happen overnight - but each day you will make progress as you choose power thoughts to be more like Jesus. it has helped me a lot with the daily Christian Life I have to follow and he teaches me something new everyday that I will always keep saved in my heart. anazing. empowering. life changing. i listen daily. its changed our family life to the better. Love it! I listen to this at least 4 times a year. It calms me! What made the experience of listening to Power Thoughts Devotional the most enjoyable? The book was so straight forward. What was one of the most memorable moments of Power Thoughts Devotional? The ah ha moment. I always understood the word but my thoughts get the best of me, this book lays it out where you can truly live in the understanding of POWER THINKING.